DO YOU enjoy the podcast? consider supporting THE SHOW! SummerPD.com – Use Promo Code: HOUSEOFEDTECH and get 10 self-paced courses for $25. My Awesome Supporters! Become one today! Get into the places you want to be. Surround yourself with what you want to do and be. Be a communicator. Allow yourself to be pushed and encouraged by others. Be selfless and be a giver. Make investments in yourself. You're worth it! Have the guts and tenacity. Neocities - Neocities is a social network of 126,900 websites that are bringing back the lost individual creativity of the web. We offer free web hosting and tools that allow you to create your own website. With significant backing from Princeton University, Wolfram Alpha, Google Education, and more, IgniteSTEM brings together thought leaders to make the “classroom of the future” a reality. Through international series of conferences, IgniteSTEM empowers educators and provides cutting edge ideas to disrupt STEM learning environments with education technology and project-based learning. Jonathan Rochelle - Product Management Director at Google Apps for Education. He managed the startup and launch of Google Classroom, Expeditions, and related Google Apps for Education. He previously worked as Product Management Director and Co-Founder of Google Docs & Drive. The company he co-founded and led as CEO was acquired by Google in 2005 to become the basis for Google Sheets. Matthew Brimer - An entrepreneur, community builder, and instigator of creative mischief. He is Co-Founder of General Assembly, and has recently launched GA’s philanthropic arm, Opportunity Fund. Brimer is also Co-Founder of Daybreaker, a global community and lifestyle brand producing conscious morning experiences around the world. Brimer also serves as an advisor to a handful of startups, including Common, Fluent City, ZZ Driggs, and Lightmatter. Brimer has been named to Vanity Fair’s “The Next Establishment”, Forbes “30 Under 30", Inc. Magazine’s “30 Under 30”, and Business Insider’s “Silicon Alley 100". Mike Swift - Founder of Hacker League, the premier platform for managing hackathons, and the Commissioner of Major League Hacking, the Official Collegiate Hackathon League. He is one of the foremost authorities on organizing effective hackathons. Sarah Shannon - Sarah is a Systemic Partnership Coach at BIE, a non-profit with a mission to promote project-based learning (PBL) in schools. As a school administrator, Sarah's experiences included visioning, strategic planning and implementing whole school improvement and change efforts. In her most recent principalship, she led the implementation of PBL at the middle school level as the first step in a district-wide shift. 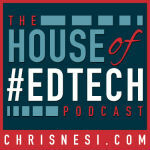 JENNIFER DUDA - A new listener of the House of #EdTech who currently teaches special education in a self-contained 5-8 Autistic classroom at the Mercer Elementary School. She's inspired to do more with technology and provide an enriched experience for her students.